Today is the first anniversary of Blue Kale Road, and what a road it has been. When I began this journey, I had no idea of all the fun, creative challenges and learning I was embarking on. It’s been a year of happy discoveries! One of the unexpected joys of writing Blue Kale Road is meeting other food bloggers, both online and in person. What a world of kind, supportive, delightful people! I was in Boston this past week to visit my parents as they prepare to move to California. In addition to having a “last hurrah” with my folks in my hometown, I was looking forward to meeting three of my favorite food bloggers. I am consistently inspired when I read Molly, Sara and Emily’s lovely blogs and I want to cook all they share. Seeing each of them in person was a treat – what a pleasure to meet such vibrant, talented women! I indulged in a few other treats last week, too - Boston is filled with amazing restaurants. Since my parents are leaving the city we took advantage of this opportunity to eat out ... a lot. We popped in to some of their local favorite spots like the Grotto, Paramount, Pierrot, the Sail Loft and even tea at the Four Seasons! 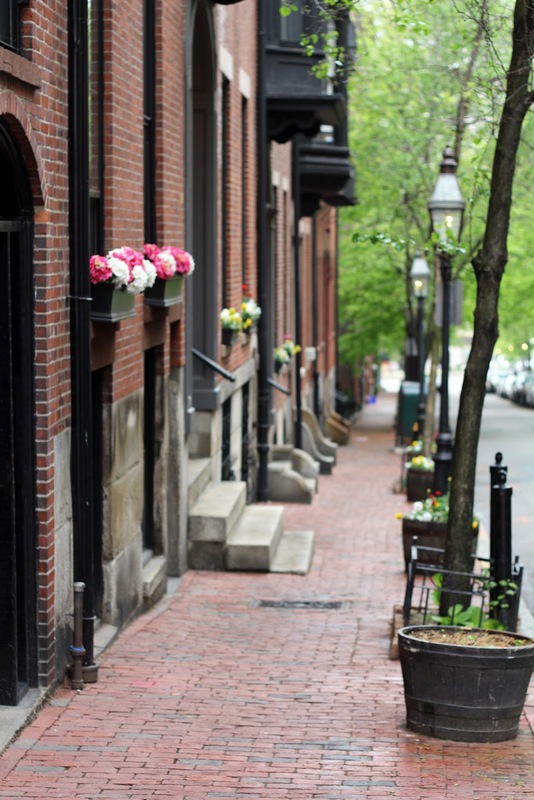 Creamy garlic soup, Greek omelets, buttery Dover sole, rich goat cheese puff pastry, glasses of champagne ... let’s just say it’s a good thing we were walking everywhere, which also allowed me to take in some of my best-loved Boston sights. A morning visit to Flour Bakery and Café left me happily filled with sweets. Joanne Chang does not disappoint! 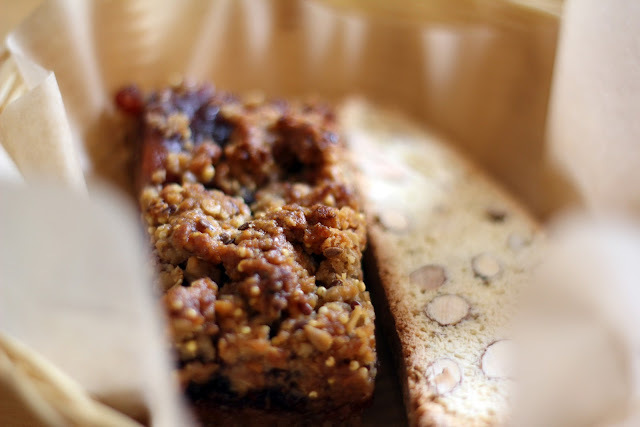 My parents and I studied the chalkboard menu filled with tempting choices and finally decided upon the granola bar, lemon ginger scone, pecan sticky roll and almond biscotti, all to share amongst ourselves with our cups of coffee. Bliss, I tell you. The Flour cookbook has been on my wish list, so I seized the moment and bought it while in Boston. What better way to bring a taste of the bakery home with me? And now I can share with you. Yesterday, my first morning home, found me in the kitchen with my cup of tea, the Hunger Games soundtrack playing and the Flour cookbook open. What to bake? I made Joanne Chang’s luscious homemade Oreos last fall for a bake sale, so I decided to focus on a breakfast item for my sleeping family. 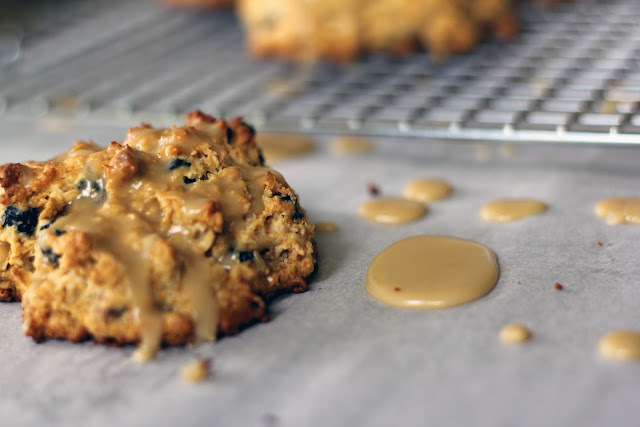 Not surprisingly, given my love of all things maple, the Oatmeal-Maple Scones called out to me. I improvised a bit with the recipe since I hadn’t been grocery shopping yet, substituting milk for cream, honey for half of the maple syrup, walnuts for the pecans and dried blueberries for the golden raisins. The resulting scones were heavenly. The maple glaze filled the craggy tops with earthy sweetness, and biting into the scone’s crisp surface yielded a buttery, flaky interior. Nibbling on a scone in the sunshine, reflecting on the past year and daydreaming about what may lie around the next curve in the road ahead made for a very content morning. I am grateful to be in this moment. In the bowl of a stand mixer, combine the flour, oats, baking powder, baking soda, salt, walnuts and dried blueberries and mix on low speed with the paddle attachment. Drop the pieces of butter over the mixture and beat on low speed for about 30 seconds, until the butter mixes in a bit but is still rather chunky. In a small bowl, stir together the milk, syrup, honey and egg until well combined. Pour the mixture into the flour mix and beat for about 30 seconds on low speed. The dough will be soft. Remove the bowl from the stand and use a spatula or plastic bench scraper to scrape the dough down from the sides and mix in any dry spots. Use a 1/3 cup measuring cup to scoop and drop mounds of the scone dough on the lined baking sheet. Bake for 30 minutes, or until the tops are golden brown. Transfer to a rack and let cool. While the scones are cooling, whisk together the powdered sugar and maple syrup. Drizzle in enough water to make a smooth glaze (I used close to 1 tablespoon). Brush the glaze over the tops of the scones, call everyone to the table and watch them pounce on the scones. Enjoy! So sad! Can't believe I never got to see that city. Thanks for the pics/posts. My pleasure, Pauline! I hope you can visit Boston sometime. I'm sure you'd be inspired to paint a lot! 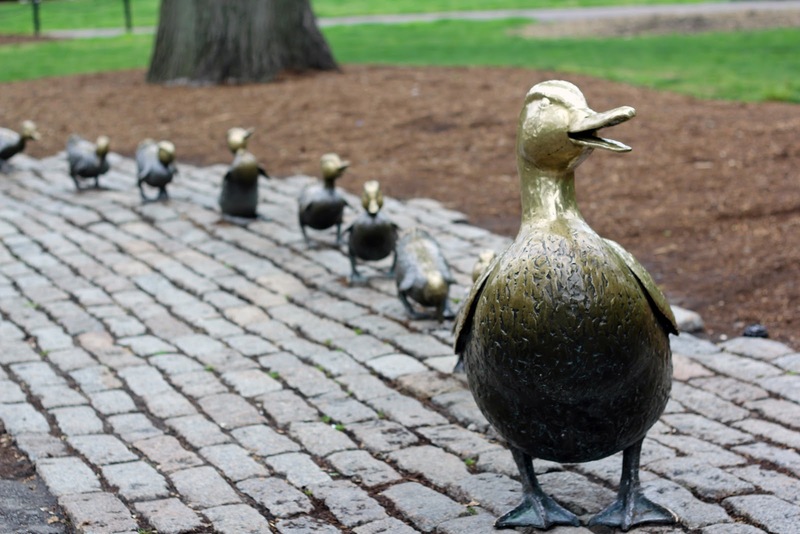 Your pictures brought back memories of Boston for me, the swan boats, that beautiful park in Beacon. Such a great city and yes the restaurants are fantastic. Your description is so vivid I felt like I was walking with you in Boston. Flour has been on my wish list for quite some time now and I am in awe of Joanne Chang. Your scones sound so delicious I can almost taste them now and I really love the blueberries you subbed for the raisins. Thank you so much, Suzanne! I'm happy you've spent time in Boston - so much to appreciate there. Hopefully you can visit Flour sometime...I can't wait to return. Happy anniversary to you and your blog! How fun that you were in Boston. I am longing to get down there and explore what it has to offer. The scones sound delicious! When I finally get to Boston, Flour is definitely on my list of places to eat! Thank you, Brianne! There is so much to explore in Boston. Oleana (in Cambridge) is another favorite restaurant of mine and one to add to your list - especially in the summer when you can sit on the patio with a glass of sangria. Heavenly! I've never been to Boston, but it looks like a beautiful town! Love the swans! And those scones look pretty beautiful, too! Yum! Thank you, Brooke! 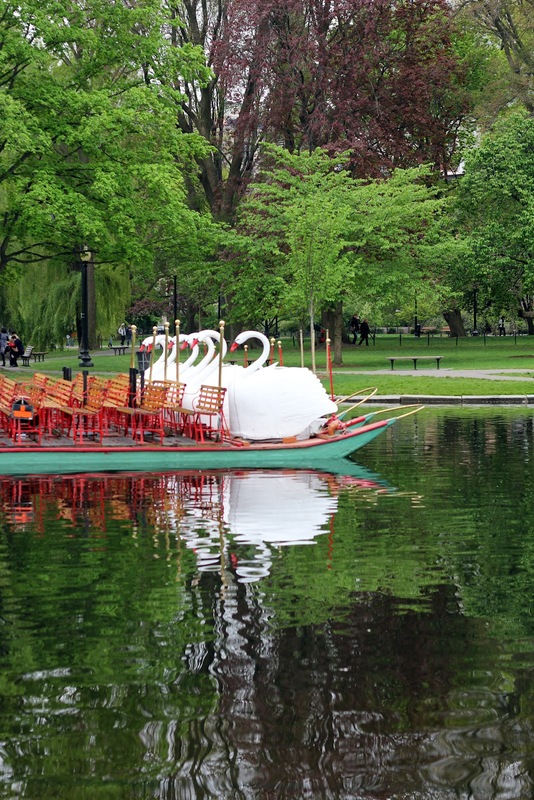 Boston is indeed beautiful, and the swan boats are fun to ride. Your boys would love them! Congratulations on your anniversary. Your trip to Boston sounds wonderful - I miss my hometown! Many congrats to you for hitting your 1-year anniversary, Hannah! I love reading your blog, and hope you have many more anniversaries to celebrate in your blogging future. These scones look fabulous - I'm pinning them to make sure I make them. I'll have to leave out the walnuts, but am assuming that'll be fine. Sounds like you had a wonderful trip to Boston. I lived there for many years and still miss it sometimes. And I'm totally envious that went to Flour. Totally, totally jealous!!! Thank you so much, Susan! I appreciate your kind words. It's a fun road to be on! Yes, you can leave the nuts out of the scones and they'll be delicious. I hope you enjoy them - I already have requests to bake them again. 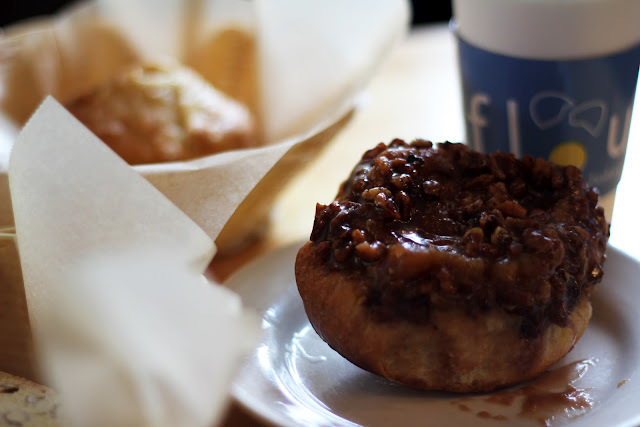 Flour was quite a treat and if you get back to Boston to visit I know you'll love popping in for a pastry. As a Boston native I'm so very glad you got to experience all the fun that is Bean-town...and I couldn't agree more. The community of food bloggers is a great one, for sure. Looking forward to BlogHer Food 2012! I don't think I had realized you've only been blogging for a year. I guess that means I've been reading your blog from just about the beginning! Congratulations on your first year. I look forward to enjoying many more of your posts. It was so nice meeting you last week. Now all I can think about doing is flying to Seattle to see you and all the amazing things that city has to offer. Thank you, Molly! You're right, I'm happy to say you've been with Blue Kale Road from the start. Congratulations Hannah - blogging for a year is no easy feat, so very well done. I echo how amazing this world of foodies is - awesome to meet people who go gaga over seemingly simple things like tomatoes, onions and everything in between. And I love scones - I made a batch last night. Froze them and baked them fresh.....this morning. Luxury. I love the way you describe the sweetness trapped in the craggy tops! Well done. Thank you, KB! I appreciate your kind words. I smiled at your "going gaga" comment...so true and so wonderful! There is nothing like a fresh, warm scone from the oven - what a way to begin your morning! Like Molly, I had no idea you'd only been blogging a year--and like Molly, how fun to know I've been following from almost the start! It was so great to meet you and I'm looking forward to doing it again next time we're in Seattle. 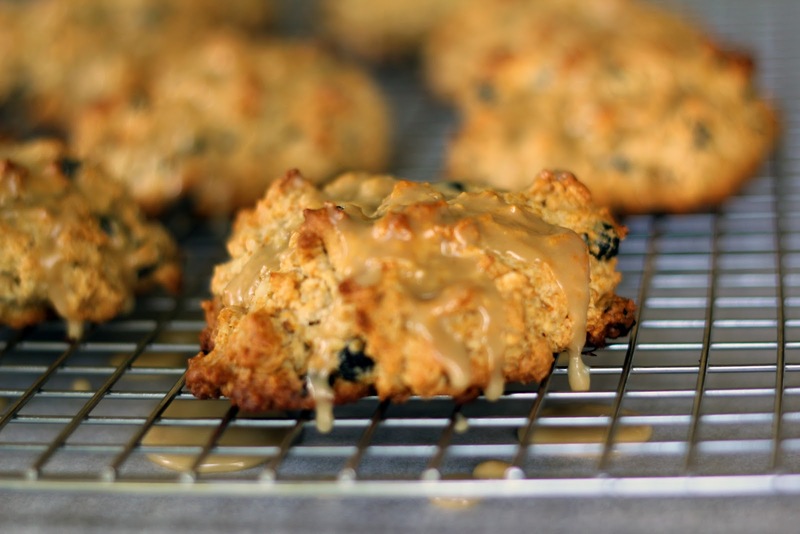 I love those oatmeal scones--I often get them when I am at Flour. A maple recipe is a perfect one to pick for a post about a trip to Boston. I'm delighted you've been with me all this time, Sara! I look forward to seeing you on your next Seattle visit, as well. My boys have requested the maple scones again, so I may freeze some to bake on Mother's Day - perfect treat for me! Happy Mother's Day to you!